I am participating in Katy Rochelle's Blockbusted Blogathon. 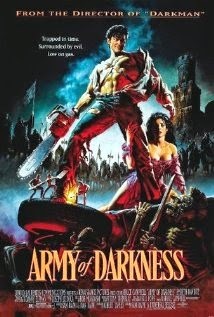 Army of Darkness is the third film in the Evil Dead franchise, and in my opinion one of the most iconic Cult Classic films of all time. It doesn't take itself seriously, which leads to so many quotable moments from lead actor Bruce Campbell. My friends and I could spend all day just using different quotes. I could put clips and gifs on this post till it the whole of the movie is posted. The cornier the better! 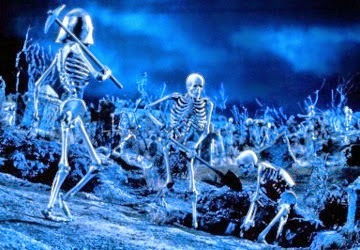 This film has more skeletons than the Jason and the Argonauts. If this film was done today it would be a CGI heavy movie. Luckily it was done back when effects where an art form. Like I said from the beginning it doesn't take itself too seriously, so they take as many action and horror cliches as possible. If you are interested in how they made some of them check out the site Book Of The Dead. The movie comes out of the gates running. It is a continuation of what happened at the end of Evil Dead II. It combines A Connecticut Yankee in King Arthur's Court, the Three Stooges, and frenetic comic-book pacing. You barely have time to catch your breath between the action and the hilarity. This is a B-flick I love the more I watch it. I know that It is sad that I can quote it line after line, but that is what keeps me coming back. This is my favourite scene in the film. 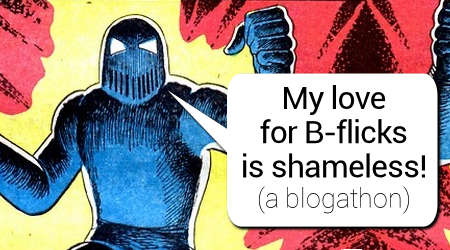 I would like to thank Katy Rochelle for allowing us to share our love of B-flicks. Also a special thanks to Ms Mariah for sharing about Katy's Blogfest! Have you seen Army of Darkness? 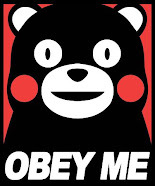 The first one I think was going for scary and came off funny. After that the next two were funny on purpose. I like them just the same. Expect no less when fighting the undead! Sound like a great hop! I love cheesy flicks, the cheesier the better. The Engineer does, too. Making fun of them is the best part. I've never seen...any of the Evil Dead movies. But your gifs made me realize...Bruce Campbell looked a lot like David Tennant. 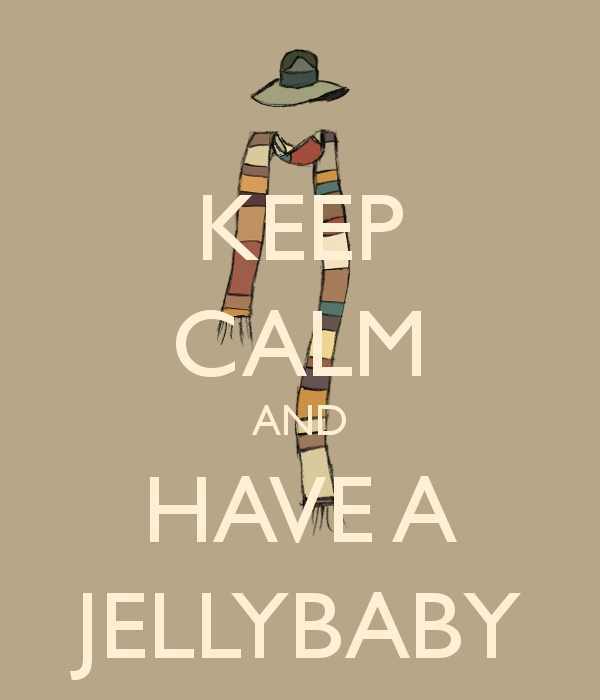 In conclusion, Sam Raimi needs to do Doctor Who. Wow, that must have been awesome. He seems the type not to be full of himself. HA! Wasn't Independence Day a lot like Mars Attacks, but with a computer virus instead of Slim Whitman's "Indian Love Call". That would be sweet if Raimi did a Doctor Who episode. Maybe have Campbell have a cameo like in his Spider-man movies. It's almost not even a bad movie since it's intentionally off the wall. I've never seen it, but the quotes are legendary. Bruce Campbell has such a way with words! Hail to the King, Baby. One of my guilty pleasures. So much so that I have an autographed poster of the movie on my Entertainment Wall -- Bruce Campbell, Sam Raimi, and Bridget Fonda who had a small role in it, and several other cast members. I only started watching BURN NOTICE because of Bruce. Before BURN NOTICE there was The Adventures of Brisco County Jr. I am ashamed I never saw that one! I personally wouldn't call Twister a B-rated movie. I think that movie is still awesome. As a matter of fact, I watched it twice just a couple of weeks ago. Thanks! Army of Darkness is an acquired taste. That's a great one also! "Ah well....... well that's just what we call 'pillow talk' baby. That's all." What a fun hop! I am a big Bruce Campbell fan, well, at least in Evil Dead II and Army of Darkness. My kids and I watch Evil Dead II at least once a year. Classic! A fellow Deadite is always welcomed! Just remember to pronounce the words correctly! Oh my goodness David, this is perhaps my absolute favorite choice in this blogfest. I love this movie! Great choice. Thanks! You can't go wrong with Bruce Campbell. 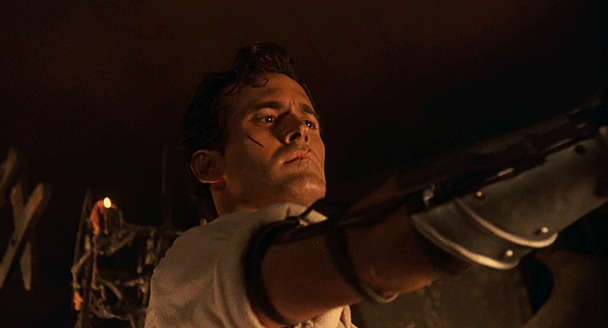 ... only good things to say about "army of darkness"... and you covered it very nicely. favorite part is, you are in charge of two things... jack and s#$T... jack left town. Love the "Groovy" scene. Great job, David. You've made me WANT to see this B-flick. I saw it in the $5 bin at Walmart last weekend. It is a must see again! Evil Dead 2 has plenty of far out moments. Back in the day I was freaked out by this movie. I have to watch Army of Darkness now. The Evil Dead trilogy is too awesome! I still haven't broke down and watched the new Evil Dead.